House Speaker Lee Chatfield (R-Levering) had a busy week. 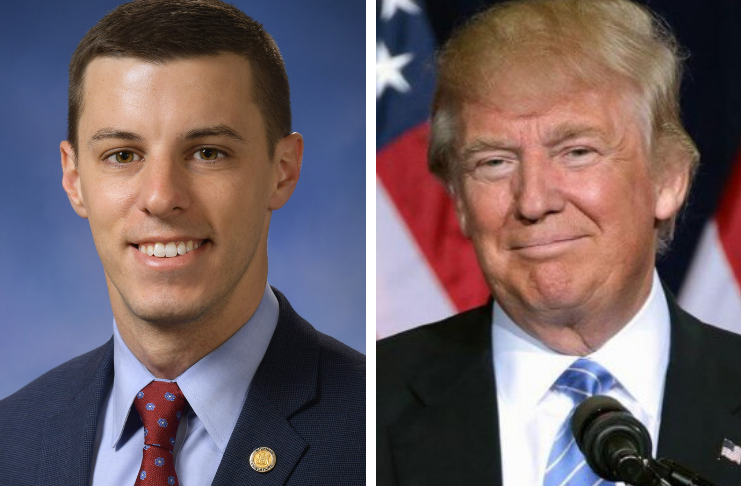 The leader of the state’s House of Representatives — and at 30 years old, one of the youngest legislative leaders in state history — spoke with the Advance in his Capitol office on Tuesday morning. Shortly thereafter, he took a call from President Donald Trump, who declined Chatfield’s invitation to hold the State of the Union at the Michigan Capitol due to the partial government shutdown, which has since ended, at least for a few weeks. Chatfield also found himself party to a quickly progressing lawsuit alleging Republican gerrymandering and spoke with the Advance of his involvement in the case. Democratic Secretary of State Jocelyn Benson on Friday announced her proposed settlement of the case. At the same time, Chatfield also found time to go on Fox News and WKAR’s Off the Record, where he said he doesn’t favor including LGBTQ people in the state’s Elliott-Larsen non-discrimination law. And he paid a reduced fine for attempting to bring a loaded, unregistered gun through an airport security checkpoint last summer. Chatfield was wearing a pistol on his hip during the Advance’s interview with him. During the wide-ranging interview, Chatfield spoke of some of his legislative priorities, nods toward increasing bipartisanship and desire not to have a repeat of last year’s frantic Lame Duck session. Michigan Advance: What do you say to those who called your invite to the president a political stunt? Chatfield: I truly believed it was the right thing to do and I would do it again if I had the opportunity. … I think it behooves us as the state of Michigan to ensure our federal government is open and operational because we have people currently living in our state that are being negatively impacted by the [now-resolved] federal shutdown. I want to do everything I can to assist those in Washington in getting their act together. Michigan Advance: Reform of Michigan’s Freedom of Information Act (FOIA) and civil asset forfeiture have been identified as your top priorities. How do you see these progressing over the term? Chatfield: With civil asset forfeiture, the reason we introduced it as our first bill is because in my speech, I called for bipartisan consensus. And I wanted to start off on the right foot and ensure that the Democrats in the House understood that we are open and willing to work with anyone and everyone who wants to move our state in the right direction and fight for the rights of our citizens. So I think we’ve laid out our priorities that I truly believe are not partisan in nature. And I look forward to working with Republicans and Democrats in the House and the Senate and [the Gov. Gretchen Whitmer] administration to get them all done. Michigan Advance: With regards to reform of the state’s civil asset forfeiture law, police unions and municipalities have been opposed to reforms in the past. How do you envision working with them to craft meaningful legislation? Chatfield: Well, they are certainly going to be at the table and we will be working with that every step of the way. And I think [police] do an incredible job in our state, and they need to be commended for the work and the sacrifice that they … do every single day for the people of our state. I think they could be they should be commended for the work that they do. We also need to ensure that they have the proper tools and ability to enforce the law and stop criminals in their tracks, while also ensuring we’re not over-criminalizing our citizens and still requiring a conviction before the government can take people’s property. There is a responsible middle ground on this issue and we are intent on reaching it. Michigan Advance: You’ve identified FOIA reform and opening up the Legislature to more sunshine as a key priority this session. Your counterpart in the Senate, Majority Leader Mike Shirkey (R-Clarklake) has also expressed willingness to look at that, but he’s expressed concerns that it could lead to a hindrance for government officials. Do you share those concerns? Chatfield: First, let me say, I think that we should be embarrassed that we ranked dead last in the arena of government transparency in our country. I think it’s unacceptable that we require our local units of government to adhere to a certain standard of transparency that we will not adhere to ourselves. I think we need to open up our records and ensure that people have access to them, while at the same time ensuring the protection — ensuring the privacy — of conversation between constituents in the representation. Michigan Advance: Do you view Shirkey’s concerns — that it could create roadblocks for elected officials — as valid? Chatfield: I understand his concerns, and I’m optimistic that we can find a consensus on this issue. Michigan Advance: Do you believe the Michigan House of Representatives should be treated any differently than say, the Emmet County Board of Commissioners up where you live, in terms of levels of transparency? Chatfield: What I want to ensure is that we take a meaningful step in the right direction in being transparent with the people we serve. I think … they have a right to know the truth about what their government is doing. And I think we have the responsibility to tell it. I am at the table and willing to work with this administration and my counterparts in the Senate to ensure that we take a meaningful step in the right direction to open up transparency in our state. Michigan Advance: You’ve made a lot of nods towards bipartisanship in the early part of your speakership, something that’s been largely absent in Michigan politics for some time. Why should people believe it now, especially in a time of divided government? Chatfield: Well, bipartisanship is a two-way street. And the burden of bipartisanship does not rest solely on the majority. But rather, I think it’s a willingness for every representative to be at the table and to legislate by sound policymaking, rather than focusing on divisive issues. And I’ll say, in an era of divided government, bipartisan consensus is necessary to ensure state government operates at any level. When we look at the dysfunction happening in Washington, I think we need to be fully committed in Lansing to ensure that we don’t become that. Michigan Advance: Did last year’s extremely busy and divisive Lame Duck session leave a bad taste in people’s mouths? Chatfield: First, let me say, I don’t anticipate having a two months like we experienced, nor do I wish to ever again. But let’s face it, we’re going to have differences; we’re going to have disagreements. I think what should define us is our ability to find consensus on issues that matter to the state and also how we handle those disagreements. I think the people of our state deserve state government that works for them [and] is more focused on the people they serve, rather than partisan, petty games. Michigan Advance: So as the leader of the House, what do you do to ensure we don’t have another Lame Duck like 2018? Chatfield: Again, let me be clear, there will be contentious bills that come up, and there will be differences. But I would like to spend the majority of our time focused on issues where we can have a real consensus where everyone is at the table participating in the process. I think many of the steps we are taking now to build healthy relationships and trust amongst ourselves is incredibly necessary, and ensuring that we represent the people this state, honestly, openly and fairly with each other. Michigan Advance: [This month], you participated in your first quadrant meeting with Whitmer, Shirkey, Senate Minority Leader Jim Ananich (D-Flint) and House Minority Leader Christine Greig (D-Farmington Hills). Can you share any details on what was discussed? Chatfield: What I will say is, I think it was a productive start to this term, where we laid a foundation have a healthy relationship with one another. And I think that relationship is essential, and ensuring that we continue communicating and building trust with one another. … I think that people in our state and country are fed up with politics as usual. And I think they’re sick and tired of petty partisan games. I think these quadrant meetings are a necessary step and ensuring that we continue to have a productive conversation and relationship to ensure we don’t reach the dysfunction that we’re currently seeing in Washington, D.C.